From a white supremacist standpoint, here’s what’s “odd” about the terrorist attack in New Zealand last week. Despite Islam being a “religion of war”, “violence” and “jihad”, not a single Muslim man, woman or child took out their weapon of choice, concealed no doubt beneath their loosely-fitted garment, to return fire upon the white supremacist who was raining bullets upon them. After all, New Zealand is closer to the U.S. than it is to the U.K.in terms of its laws and culture on the private possession of firearms. Now I am no mathematician, but surely the relative prevalence of firearms in New Zealand, an “intrinsically violent religion”, and hundreds of its adherents being gathered across two sites (Al-Noor mosque and Linwood Islamic Centre), should have substantially increased the odds of some Muslims being in possession of their own weapons of choice; no? The imam at least, being the preacher of such a “religion of hatred”, surely had a well-used and ready to be re-used AK47 resting restlessly upon the side of the pulpit; no? 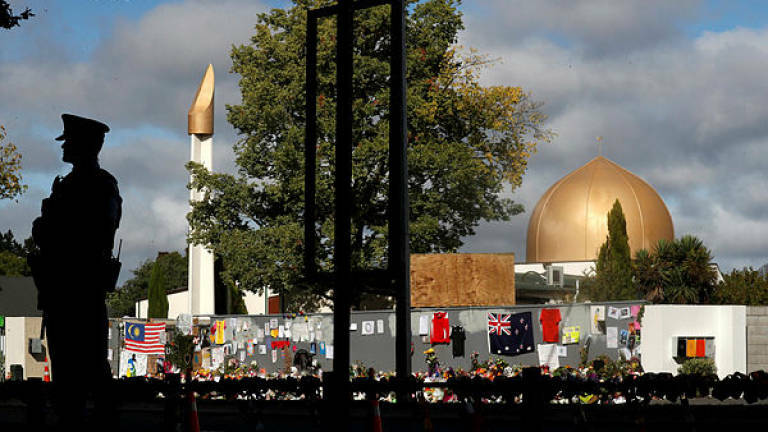 So, between two mosques and hundreds of worshippers, no Muslim returned fire or was in possession of any firearm, hand grenade or improvised explosive device to return fire in self-defence on this cowardly terrorist? You see, it’s not that this did not transpire, it’s that the terrorist knew that it would not transpire that is most revealing! This lowlife did not believe his own rhetoric that Muslims were violent jihadis out to win the war of civilisations by out-killing and out-breeding the “native” whites en masse, which justified the killing of them during “mass”. Like most of us, he knew that the Muslims in prayer were peaceful people, as evidenced by the first Muslim he encountered who welcomed him in. That’s why he was able to walk in and out of the first mosque twice without fear of reprisal. That’s why he was able to drive to the second place of worship (Linwood Islamic Centre), unconcerned that these networked “crazy Muslims” would have alerted their “jihadi brethren” in the neighbouring area, where he continued his rampage. That’s why the cowardly terrorist was scared and sped off in his car, having “only” killed 6 Muslims at this second site, when confronted by a Muslim (Abdul Aziz) yielding a handgun! Here was a white supremacist armed to the teeth, with battle music playing in the background, in full combat gear but retreating at the first sight of resistance? Why? Because that was not part of the plan. He absolutely did not expect these violent jihadi crazed Muslims to be, erm, violent, even if in self-defence. The fact is, Abdul Aziz was inside Linwood Islamic Centre when he heard gunshots outside. On hearing this he charged the terrorist not with a gun, because he had no such weapon, but with the first thing he could grab, a remote credit card machine. He threw this at the gunman with the intent of leading him away on a chase, which duly ensued. When the terrorist returned to his vehicle to retrieve another weapon, Abdul Aziz picked up the empty handgun that the terrorist had dropped and hurled it at his vehicle. The impact not only shattered the vehicle’s windscreen but also the fragile confidence of the “disbelieving” terrorist, who fled the scene. Apparently, being shot at, killed, or even being thrown a gun he had dropped was not part of the plan, which he had admitted before embarking on his killing spree. In other words, here was a white supremacist who was confident in the peace-loving nature and disposition of those Muslims he had planned to kill. What does that tell you? Even this mass murderer knew, deep down, that he could fire thousands of bullets upon Muslims indiscriminately and live to tell the tale in court. Given this tragedy can we now please stop essentialising Muslims and Islam as being intrinsically this or that. Such claims are not only intrinsically flawed, as the heterogeneous reality of Muslim communities and studies in lived religion, everyday Islam, the sociology of religion, and nature of religious epistemology prove, but is in fact intrinsically and irredeemably irresponsible. Note: as per all decent people, my heart bleeds with those who died and were injured in these attacks. I hope the irony in the above piece does not displease those of us still reeling in pain. It was employed to make a point that seemed pertinent.